October 2nd is a date you should put aside immediately and make plans to attend this one night only chance to hear from Curtis Bowers, live and in person! His appearance is being hosted by the East Valley Tea Party in Mesa. Curtis Bowers is the man who risked it all to make his award winning documentary “Agenda: Grinding America Down.” Tens of thousands of copies have been sold, and countless millions have seen this film. It has changed hearts and minds and raised the level of awareness of the dangers to America all across the country. At 5:00 pm, the full 90 minute film will be screened at Burke Basic School. 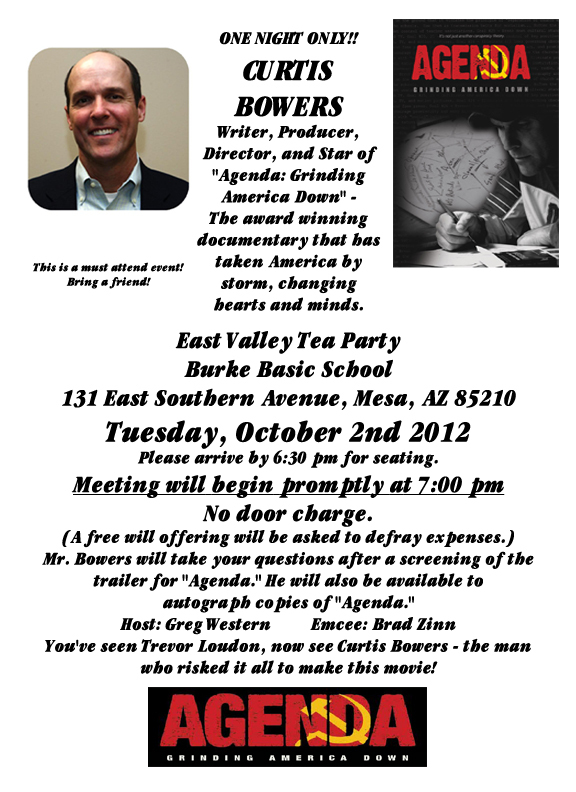 Afterwards there will be a short break, and the regular meeting of the East Valley Tea Party will begin at 7:00 pm. At 7:00 pm there will be a brief showing of the trailer for “Agenda” and then Curtis will speak and answer questions. He will also be available to auotgraph copies of “Agenda” afterwards. The event will be held at Burke Basic School, 131 East Southern Avenue, in Mesa. Bring a friend, and don’t miss this opportunity to hear from a courageous man who followed his heart to make a difference. You have seen Trevor Loudon and Dr. David A. Noebel, two of the featured guests in “Agenda,” now see and hear from the man who created and produced it. Arizona university students have contributed over $120,000 in cash and funded countless man hours to support the Yes on Proposition 204 campaign, which would permanently raise the state sales tax, yet most of them probably don’t even know they’ve made a contribution. In fact, many of them may not even agree with the initiative. In a Special Investigation released Thursday, Goldwater Institute Investigative Reporter Christian Palmer explains how the Arizona Students Association broke its own rules earlier this year when the student-funded 501(c)(4) organization applied its money and manpower to aid the Quality Education and Jobs Committee, a political committee formed to launch the statewide ballot initiative now called Prop 204. This week, four students who sit on the ASA board as Arizona State University representatives resigned their positions, citing their inability to speak out against ASA internal politics, including how the organization’s funds are spent. Another representative resigned his ASA board post earlier this month. One former ASA board member told the Goldwater Institute that when he tried to speak out against the organization’s actions last year, professional staff threatened to sue him. Founded in 1974, the ASA is a student group representing the 130,000 students who attend ASU, Northern Arizona University and the University of Arizona. According to the ASA’s mission statement, the organization works to “make sure that higher education in Arizona is affordable and accessible by advocating to elected officials and running issue campaigns to engage students.” The ASA reaped more than $585,000 from Arizona university students in 2012. Over the course of the past five years, the group has received $2.6 million in fees. The Goldwater Institute found that the ASA doesn’t have to get approval from students before it determines how to spend funds, but it is required to get approval from its board of directors, which is comprised of elected representatives of the student body. However, those directors’ one-year terms make board turnover nearly constant, which means significant power resides with the ASA’s professional staff members. According to former ASA board members interviewed by the Goldwater Institute, members of the ASA’s professional staff knowingly ignored the organization’s bylaws in order to help Prop 204. This controversy emerged last spring, when several board members refused to support Prop 204, and took steps to ensure the ASA did not endorse the initiative. Having repeatedly failed to secure that endorsement from a majority of the board, the ASA’s professional staff proceeded to earmark organizational resources for the initiative campaign, including cutting a $20,000 check to the campaign, despite the fact that ASA internal financial policies require the board to review and approve all expenditures of $300 or more. In June, having been almost entirely repopulated by newly elected board members, the ASA board voted to contribute $100,000 to the Yes on Prop 204 campaign, making the ASA a larger contributor to the campaign than the teachers’ unions and school boards association and second only to a contractors’ group. The ASA’s contributions to the Yes on Prop 204 campaign raise legal questions about whether their actions constituted unconstitutional “compelled speech” on behalf of its student funders. The U.S. Supreme Court has ruled in cases on similar issues that people cannot be forced to fund political speech with which they disagree. Because all students are required to pay the fee to the ASA and the process for obtaining a refund isn’t advertised and is cumbersome, the fee may violate the First Amendment rights of university students. The Goldwater Institute is examining these recent events and is considering legal action on behalf of ASU students. 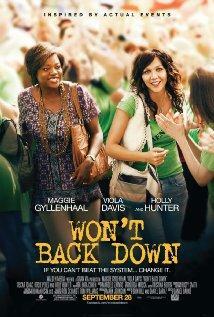 Mark your calendar for Friday, September 28, when the feature film Won’t Back Down hits theaters. Based on real events in California, the movie depicts a group of parents’ efforts to reform a failing school. Hollywood stars Maggie Gyllenhaal (The Dark Knight, Away We Go) and Viola Davis (The Help) play two devoted mothers who gather signatures for a petition to take over their children’s school, one that has underserved students for years. California is one of four states with a “parent trigger” or “parent empowerment” law that allows parents to petition to convert a traditional school into a charter school or replace school leadership. Under these laws, at least half of the parents in a failing school must support the transition. California, Texas, and Mississippi passed laws in 2010 and 2011, while Gov. Bobby Jindal signed Louisiana’s law earlier this year. The Arizona State Senate passed a “parent empowerment” bill last March, though the measure eventually stalled in the House. Lawmakers in at least 20 other states are considering the reform idea. Two weeks ago, Businessweek explained how the parent empowerment law has given parents in Adelanto, California new hope. Doreen Diaz joined with other Desert Trails Elementary parents in 2010 and petitioned to turn their school into a charter school. With the help of Parent Revolution, a non-profit based in Los Angeles, Doreen gathered signatures and began a grueling battle with school and district leaders. While the fate of Desert Trails remains unresolved, Doreen insists drastic action is needed to help its students. “I hope that more people see [Won’t Back Down] and are inspired to stand up and fight,” Doreen says. She can point to McKinley Elementary, where parent engagement spurred the creation of a charter school nearby—a school that outperformed McKinley in the first year it was open—or the dozen states considering parent empowerment laws. I hope Won’t Back Down inspires lawmakers to give parents the freedom to turn failing schools into success stories. Jonathan Butcher is the education director for the Goldwater Institute. The below press release from the Tucson Hispanic Chamber of Commerce is gratefully received. The number of organizations and individuals that oppose Proposition 204 is growing every day. The Tucson Hispanic Chamber Board of Directors has voted to oppose Prop 204 – the Quality Education and Jobs Initiative. The chamber’s Business Advocacy Committee which is composed of members of the Chamber from Southern Arizona recommended opposition of the controversial initiative to the Board of Directors after hearing the pro debate and the con debate from the opposing sides of the argument. Tannya Gaxiola, the Chairwoman of the Tucson Hispanic Chamber expressed that “Our decision was not made lightly. We are concerned about the quality of Arizona’s education, the importance of a highly educated and trained workforce, and the challenge southern Arizona particularly faces in attracting , retaining and growing businesses to our State. We realize that this issue is of upmost importance to our small business community.”The initiative would make permanent the one cent sales tax that was passed two years ago. The Tucson Hispanic Chamber supported the temporary sales tax in 2010. “However, our members were concerned about the elimination of the promise to the business community of a temporary tax, the further tying of the hands of our elected officials who we have voted to represent us, and the broad scope and complexity of the initiative which includes infrastructure and public health along with education. “stated Lea Marquez Peterson, the President/CEO of the Tucson Hispanic Chamber.Prop 204 would further hamper our elected representatives and make it challenging to have any flexibility during a budget crisis like the State experienced over the last two years. In addition, the passing of Prop 204 would mean that nearly two-thirds of state spending will be mandated by voters and that Arizona would have the second highest sales tax in the U.S. further impeding our ability to attract business to our state. The Tucson Hispanic Chamber applauds the goal of reforming education and finds it worrisome that Arizona ranks near the bottom of all states in spending per pupil – $7,848 versus $10,615 nationwide, however, the Chamber is concerned that the initiative provides a permanent funding stream, throwing money at the problems without addressing possible efficiencies in education, State spending priorities, or providing sufficient accountability for results. The Tucson Hispanic Chamber Board of Directors believes that in order to improve the level of education funding in Arizona, voters should elect legislators who take that priority into consideration with all of the State’s other pressing needs. As of now, “NO” is winning by a margin of six points, but a strong showing in a survey like this can only help. For more information, please visit our Facebook Page or our Website. Decades of experience have shown us that high taxes dampen economic growth. State policymakers hoping to encourage job growth are right to worry about their state’s tax load on the private sector. What needs more attention than it gets now is what a state taxes. As it turns out, most states actually rely on the very tax that slows job growth the most: the income tax. Most states, for instance, assess higher income tax rates on those with higher incomes. Not only does that penalize those who are most successful in the private sector, it inhibits job growth by making small businesses – which are typically the creators of the largest share of jobs in most states and pay their income taxes through the personal income tax code – pay higher taxes the more they grow. States with graduated-rate income taxes, like Arizona, also tend to see government revenues grow faster than personal incomes and that means the government gets richer faster than the private sector. That’s always bad for long-term economic growth. The best way out of the trap is to eliminate the tax that is the most damaging to economic growth. Eliminating the income tax in Arizona could not only remedy these problems but also help launch the state into the ranks of the economic powerhouses like Texas. This policy change could still create more than 20,000 new jobs in the first year because it gets rid of the hidden economic costs associated with an income tax. Every state has natural advantages and disadvantages that policymakers cannot control. But they can control tax policy. Getting rid of the income tax is the only policy bold enough to fundamentally boost long-term economic growth in Arizona. Stephen Slivinski is a senior economist at the Goldwater Institute. Arizona’s Jeff Flake has a strong record of standing up for our nation’s veterans and servicemen and women, and that’s a record he will continue in the Senate. Below is a sampling of freestanding pro-veteran legislation that he has supported during his time in Congress. · HR 2540 – Veterans’ Compensation Rate Amendments of 2001, a bill that increased rates of compensation for certain veterans and their dependents. · S 1156 — Veterans Health Care, Capital Asset, and Business Improvement Act of 2003, an omnibus-type bill that enhanced health care authorities for veterans, authorized projects and new facilities, and enhanced personnel matters within the VA.
· HR 1516 — National Cemetery Expansion Act of 2003, which directed the Secretary of the VA to establish six new national cemeteries. · HR 1460 — Veterans Entrepreneurship and Benefits Improvement Act of 2003, which would have created preferences for veteran-owned businesses within the SBA, among other provisions. · HR 1257 — Selected Reserve Home Loan Equity Act, which would have made permanent the authority for individuals who complete six years of service in the Selected Reserve to receive home loans guaranteed, insured, or made through the Department of Veterans Affairs. · HR 100 — Servicemembers Civil Relief Act, which revised provisions with respect to certain civil protections and rights afforded to service members while on active-duty assignment. · H Res 1070 — Expressing the sense of the House of Representatives that Members of the House should actively engage with employers and the American public at large to encourage the hiring of members and former members of the Armed Forces who were wounded in service and are facing a transition to civilian life. · HR 5037 — Respect for America’s Fallen Heroes Act, which protects funerals at national cemeteriesfrom protests. · HR 4061 — Department of Veterans Affairs Information Technology Management Improvement Act of 2005,which would have ensured that the CIO of the VA received all proper resources for IT systems, ensuring that veterans were being served by the best technology. · HR 3200 — Servicemembers’ Group Life Insurance Enhancement Act of 2005, which made permanent authorities previously passed by Congress that increased the maximum coverage under the Servicemembers’ Group Life Insurance and the Veterans’ Group Life Insurance programs from $250,000 to $400,000. · H Res 1098 — Supporting the goals and ideals of the Year of the American Veteran. · HR 6445 — Veterans’ Health Care Policy Enhancement Act of 2008, would have enhanced several benefits for various veterans. · HR 5892 — Veterans Disability Benefits Claims Modernization Act of 2008, the bill would have increased the number of veterans eligible for disability compensation by modifying the requirements for eligibility, and contained some other provisions. · HR 4169 — American Braille Flag Memorial Act, would have authorized the Secretary of the Army to place in Arlington National Cemetery an American Braille tactile flag honoring blind members of the Armed Forces, veterans, and other Americans. · HR 3819 — Veterans Emergency Care Fairness Act of 2008, which would have required certain veterans to be reimbursed for the cost of emergency treatment received in a non-VA facility, and other provisions. · HR 2239 — Early Access to Vocational Rehabilitation and Employment Benefits Act, which would have extended eligibility for vocational rehabilitation benefits to disabled servicemembers not yet discharged from the military but who are likely to be discharged because of their condition. · HR 2192 – To establish an Ombudsman within the Department of Veterans Affairs, which would have established within the VHA an Office of the Ombudsman, responsible for serving as a last resort for veterans’ health care and benefits complaints and issues that cannot be resolved at a local or regional level and maintaining a public website with contact information for each patient advocate at each VA medical center. · HR 1538 — Dignified Treatment of Wounded Warriors Act, would have established policy for care, management, and transition of servicemembers with serious injuries or illnesses. · HR 1527 — Rural Veterans Access to Care Act, would have provided greater access to care forveterans in rural areas. · HR 797 – Dr. James Allen Veteran Vision Equity Act of 2007, which provided veterans who are blind in one eye and starting to go blind in the other eye eligibility for benefits right away, instead of waiting for them to go totally blind. · HR 612 — Returning Servicemember VA Healthcare Insurance Act of 2007, which would have enhanced medical care for combat veterans. · HR 327 — Joshua Omvig Veterans Suicide Prevention Act, this bill created policies to help deal with suicide amongst veterans. · HR 67 — Veterans Outreach Improvement Act of 2007, this bill sought to improve coordination of outreach efforts within the VA.
· S 3860 — A bill to require reports on the management of Arlington National Cemetery. · S 1963 — Caregivers and Veterans Omnibus Health Services Act of 2010, which enhanced policy for caregiver support, female veterans, mental health care, and other matters. · H Res 1385 — Recognizing and honoring the courage and sacrifice of the members of the Armed Forces and veterans, and for other purposes. · H Res 868 — Honoring and recognizing the service and achievements of current and former female members of the Armed Forces. · H Res 398 — Recognizing the 60th anniversary of the Berlin Airlift’s success. · H Res 360 — Urging all Americans and people of all nationalities to visit the national cemeteries,memorials, and markers on Memorial Day. · H Res 291 — Recognizing the crucial role of assistance dogs in helping wounded veterans live more independent lives, expressing gratitude to The Tower of Hope, and supporting the goals and ideals of creating a Tower of Hope Day. · H J Res 80 — Recognizing and honoring the Blinded Veterans Association on its 65th anniversary of representing blinded veterans and their families. · HR 4505 — To enable State homes to furnish nursing home care to parents any of whose children died while serving in the Armed Forces. · HR 2990 — Disabled Military Retiree Relief Act, which would have adjusted retired military pay and grade for reserve members who are recalled to active status and who completed at least two years of service in active status, as well as other provisions. · HR 1168 — Veterans Retraining Act of 2009, the bill would have provided financial assistance to unemployed veterans who were enrolled in a training program that teaches a skill that’s in demand. · HR 1089 — Veterans Employment Rights Realignment Act, the bill would have helped eliminate a backlog of complaints filed with the Department of Labor by veterans who lost their job because of their military service. · HR 1037 — Veterans’ Benefits Enhancement Act of 2009, the bill would have directed the Department of Veterans Affairs to conduct a five-year pilot program to expand work-study opportunities for veterans. · HR 1016 — Veterans Health Care Budget Reform and Transparency Act of 2009, which authorized advanced appropriations for VA medical accounts – this will ensure that in the event of a shut down or other partisan stalling, veterans’ health care will continue. · HR 4201 — Servicemember Family Protection Act, the bill would have amended current law to address custody issues. · HR 1484 — Veterans Appeals Improvement Act of 2011, the bill would have established a VeteransJudicial Review Commission charged with reviewing and making recommendations to Congress to improve the appellate review process for veterans’ benefits. · HR 1383 — Restoring GI Bill Fairness Act of 2011, this bill corrected a serious problem related to S 3447 that would have resulted in AZ veterans having to pay more money out of pocket for their tuition. For more information on Jeff Flake and why he’s running for the U.S. Senate, please visit his website at www.JeffFlake.com.